Award-winning Colorado architecture firm Arch11 was recently recognized by The Wall Street Journal for the design of a Boulder home reflecting elements of a Buddhist monastery honoring the homeowner’s Japanese heritage. The modern minimalist home, built for an active mountain climbing couple, makes the most of its modest size through clever planning and refined details. Recently recognized in The Wall Street Journal, this Arch11-designed home – shown from the backyard – embraces the homeowner’s Japanese heritage through subtle details. It was a fun challenge to honor Norie’s family heritage while creating a modern home fit to this active couple’s lifestyle. The award-winning team at Denver and Boulder, Colorado-based architecture firm Arch11 was recently recognized by The Wall Street Journal for the design of a Colorado home that reflects elements of a Buddhist monastery in rural Japan. Avid climbers and outdoor enthusiasts Norie Kizaki and David Wolf wanted Kizaki’s childhood memory of the monastery, where her father was a monk, to influence the design of their modest modernist house, according to the article, “A Home with a Hint of Monastery,” yet they also wanted it to fit into their neighborhood’s mix of 1950s-era ranch houses and Colonial bungalows. Japanese elements on the exterior of the home are “visible, but subtle,” according to the article, including the cypress of the front door and part of the façade, darkened with a Japanese charred-wood technique called shou-sugi-ban. Traditional elements are more obvious indoors, where Arch11 principal E.J. 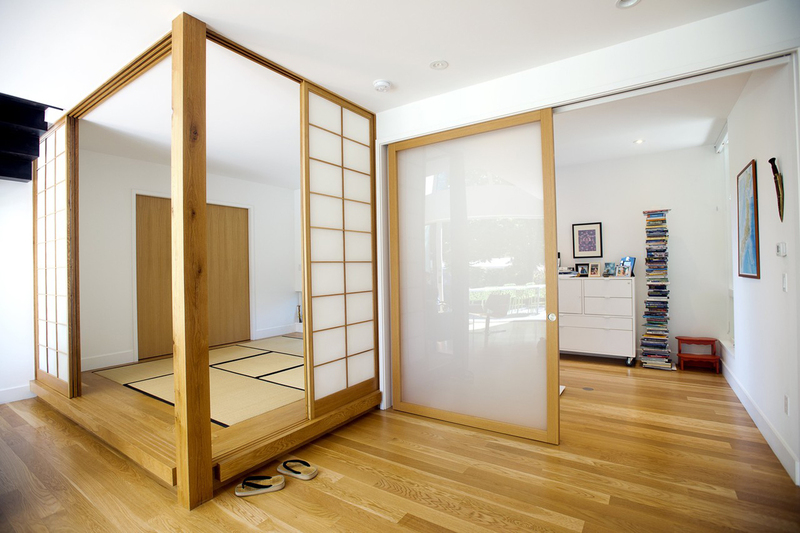 Meade, familiar with many of the principles of Japanese design, created the main floor around a tatami room, surrounded by sliding shoji screen doors and furnished only with rice mats on the ground – a space the homeowners use for meditation, dining and TV watching. Other Japanese elements to the 1,800-square-foot home include a small front entry inspired by a traditional genkan where guests can slip off their street shoes and cozy into house slippers. And a cantilevered bathroom off the master bedroom holds a wet room, or Japanese ofuru, with a shower and a deep Japanese soaking tub. A floating staircase made of plate steel and tension wire provides a dynamic central design element for the living room, which also features large glass doors leading to the backyard where the couple tends a vegetable garden and a Concord grape orchard that has been on the property since the 1950s. The house is built on the foundation of the original ranch house the couple bought in 2010 for its proximity to Boulder’s famed Flatirons. To accommodate three bedrooms and two bathrooms in the diminutive 700-square-foot upper level, Arch11’s Meade kept hallways and corridors to a minimum and ceilings high to maximize the feeling of space. 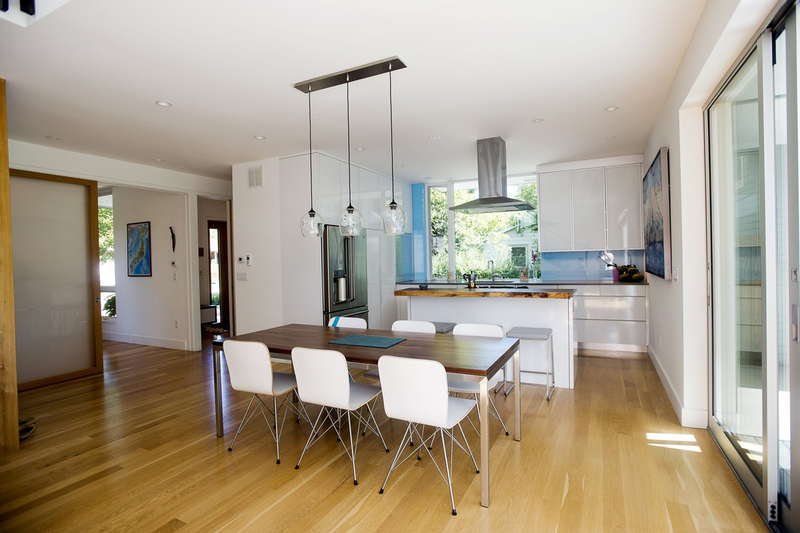 White walls, white oak floors and minimal furniture throughout the home also create a light and quiet environment. From a small and “smart” green-built Colorado cabin to a luxurious indoor-outdoor Denver house designed around a stunning pool to a LEED Gold-certified custom home with a Sub-zero and Wolf Design Award-winning kitchen at the edge of Boulder’s Flatirons, Arch11 designs distinctive modernist residences with heirloom-quality details that are sensitively integrated with their sites and the environment. 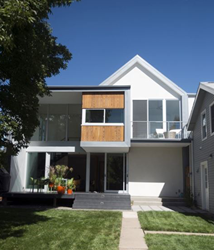 Founded in 1993, Arch11 has gained recognition for projects ranging from exceptional residences to institutional planning, mixed-use development and product design, including a 2009 Firm of the Year Award from the Colorado AIA North chapter, and in 2017, Colorado Homes & Lifestyles Circle of Excellence Award for principal E.J. Meade and a spot on the magazine’s “Fabulous List.” With offices in Boulder and Denver, Colo., Arch11 has over 30 combined years of green building technology leadership. The staff’s unusual level of hands-on experience ranges from boat building to furniture making, contributing to its reputation for commitment to craft, detailing and design integrity. For additional information visit http://www.arch11.com. The homeowners asked Colorado architects Arch11 for a “fast and light” sensibility, which relates to their passion for climbing as well as Japanese design, for their Boulder home. Arch11 chose cypress for the front door and part of the façade, darkened with a Japanese charred-wood technique called shou-sugi-ban, then added a modern porch swing. The Arch11-designed Boulder home features white oak floors and white walls throughout for a spacious, tranquil environment. Arch11 designed a traditional Japanese tatami room, decorated only with rice mats on the floor and surrounded by shoji screens, as a central element of the main floor living space.